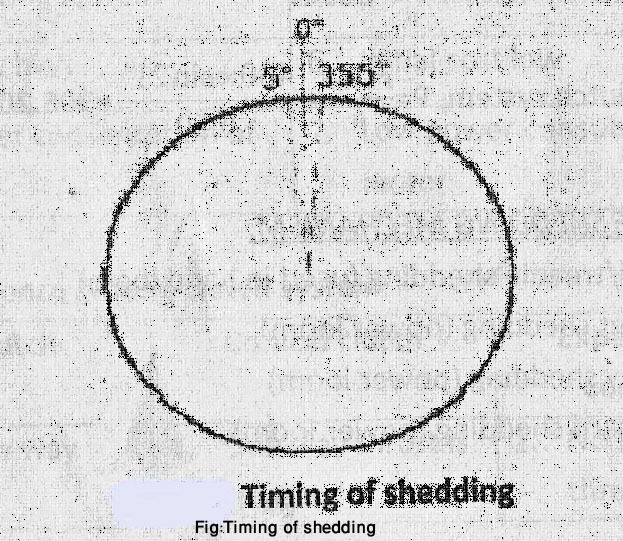 If the heald shafts are at the same level when the crank comes to the top centre, that is 0 degree or 360 degrees, then it is known as normal shedding. A shed is said to be early when the pick insertion is effected after the shed is completely open. If the heald shafts are at the same level when the crank comes to 355 degrees or 5 degrees before the top centre, then it is known as early shedding. Fabric cover is improved, because during beat-up, the warp yarns are evenly distributed. It assists in clearing the shed while weaving fibrous warp like woollen & worsted. So entanglements are avoided. Heavy weft yarn can be easily inserted. So hard weaves like corkscrew weaves can be woven. As the warp yarns are open widely during beat-up, strain on the warp yarn is high. Early shedding causes chaffing of warp yarn (yarn abrasion) & end breakage may occur. 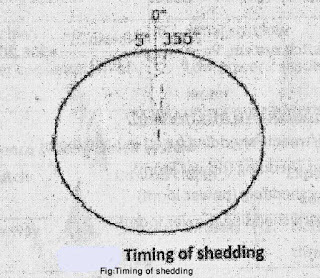 If the shafts are at the same level when the crank comes to 5 degrees after top centre, then the shedding is known as late shedding. Late shedding allows the weft yarn to get beaten up before the shed has been properly crossed. During beat-up opening the shed is minimum. So strain on the warp yarn is low.